Wind blowing in your hair and with power to blow you away :-). Created on 25 Mar 2007, last changed on 17 Aug 2007. This album is empty. This album has been viewed 2095 times since 25 Mar 2007. Special edition of a 309 GTI becoming truly special! Created on 06 Nov 2006, last changed on 07 Aug 2007. This album contains 66 items. This album has been viewed 14350 times since 06 Nov 2006. 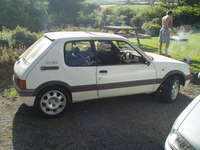 205 GTI with 3 liter 24 valve V6 engine! Last changed on 09 Jan 2007. This album contains 129 items. This album has been viewed 16845 times since 09 Jan 2007. 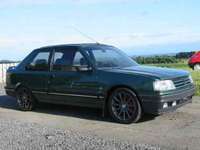 Not the usual 205 Mi16 conversion as this one utilises the Mi16x4 4wd drivetrain too! Created on 04 Feb 2007, last changed on 07 Oct 2007. This album contains 96 items. This album has been viewed 17231 times since 04 Feb 2007. Built from ground up and uprated all-round! Created on 10 Nov 2006, last changed on 18 Dec 2006. This album contains 36 items. This album has been viewed 4769 times since 10 Nov 2006.